Published on 10. 05. 2013 in comics and cartooning and hype & linkage. Closed Tags: Copenhagen Comics, Danisch Comics Council, Dansk Tegneserieråd, Ping Wards. 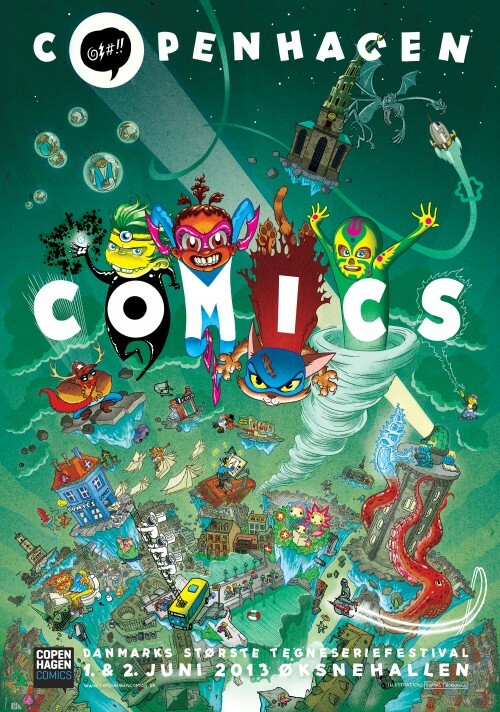 This year sees the fifth international comics festival in Copenhagen, this year under the name Copenhagen Comics. I’m biased, but I think the organisers have put together a truly impressing program this year, topping even that of 2010, which was stellar. It’s on the weekend of June 1-2 at Øksnehallen in Copenhagen, with additional events on Friday 19. Among the international guests are Anke Feuchtenberger, Jaime Hernandez, Melinda Gebbie, Emmanuel Guibert, and Jiro Taniguchi, while on the genre side, people like Jill Thompson, Brian Azzarello, Frazer Irving and Charlie Adlard are representing. As usual, there’ll be tons of events, interviews, workshops, exhibits, and all that. In addition, we at the Danish Comics Council are planning an academic colloquium at the University of Copenhagen on Friday 19, free and open to all. The theme is teaching comics and comics as teaching tool. An international panel of scholars and cartoonists will be present and yours truly will be on hand to conduct an artist talk with Adlard, about storytelling, The Walking Dead, and cross-media success. The culmination of the weekend, however, will no doubt be the Ping Awards ceremony on Saturday night. Last year, the the Danish comics website Nummer9.dk and the Danish Comics Council launched this new industry award, named after the beloved Storm P. character from the strip Peter og Ping, in collaboration with the Storm P. Museum. After a sold-out smash of a party last year, we’re looking forward hopefully to topping ourselves with an even more ambitious show. Read more about the show, the awards and the people behind at the Ping website (and on Facebook), and buy your ticket now, before they sell out. Above: Bunker denizen Thomas Thorhauge’s festival poster. See his process report here.